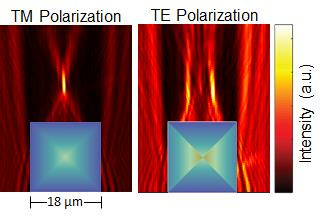 Figure shows how the PSi square GRIN microlens focuses and splits TM and TE polarized light, respectively. TM polarized light is focused to one point and TE polarized light is focused to two different points. The refractive index gradient for the square microlens under the two different polarizations is illustrated using the color map overlaid on the lens (blue is low refractive index, and orange is high refractive index). “The emergence and growth of transformation optics over the past decade has revitalized interest in using GRIN optics to control light propagation,” explained Paul Braun, the Ivan Racheff Professor of Materials Science and Engineering at Illinois. “In this work, we have figured out how to couple the starting shape of the silicon micro-structure and the etch conditions to realize a unique set of desirable optical qualities. For example, these elements exhibit novel polarization-dependent optical functions, including splitting and focusing, expanding the use of PSi for a wide range of integrated photonics applications. “The key is that the optical properties are a function of the etch current,” Braun said. “If you change the etch current, you change the refractive index. We also think that the fact that we can create the structures in silicon is important, as silicon is important for photovoltaic, imaging, and integrated optics applications. “Our demonstration using a three-dimensional, lithographically-defined silicon platform not only displayed the power of GRIN optics, but it also illustrated it in a promising form factor and material for integration within photonic integrated circuits,” stated Neil Krueger, a former PhD student in Braun’s research group and first author of the paper, “Porous Silicon Gradient Refractive Index Micro-Optics,” appearing in Nano Letters (DOI: 10.1021/acs.nanolett.6b02939). Contact: Paul Braun, Department of Materials Science and Engineering, University of Illinois at Urbana-Champaign, 217/244-7293.